I’m always looking for recipes that are low effort with a big pay off and this Chocolate Glazed Tart is one of them. As a matter of fact, many tarts are. Tarts are like a cheat – most look fancy but are actually easy. That’s probably why that phrase “tart” came about to refer to certain ladies. Or not ladies? O.K., let’s not go there…Some tarts have a pastry crust which is always more effort but so many tarts are made with a press in cookie or shortbread type crust or a crumb crust, either graham cracker or cookie crumb like this one. That makes them super simple, and they always seem special just because they’re tarts. So get yourself a 9″ tart pan with a removable bottom and you know I’ll keep posting recipes for them! And then make this glorious deep dark chocolate on chocolate on chocolate tart and make everyone at the table go nuts! I adapted my Chocolate Glazed Tart recipe from a recipe at Epicurious. I’ve actually made it a few times over the years and changed it up since it was first published in Gourmet in 2006. That must have been shortly before the magazine went under…I always enjoyed reading Gourmet and dreaming of the recipes I might make for the imaginary dinner parties I’ll probably never have! Another one of my fave super easy desserts came from Gourmet, too. It’s the flourless chocolate cake I call Inner Sanctum Chocolate Cake. But back to this tart! It really is deep, deep chocolate flavor. 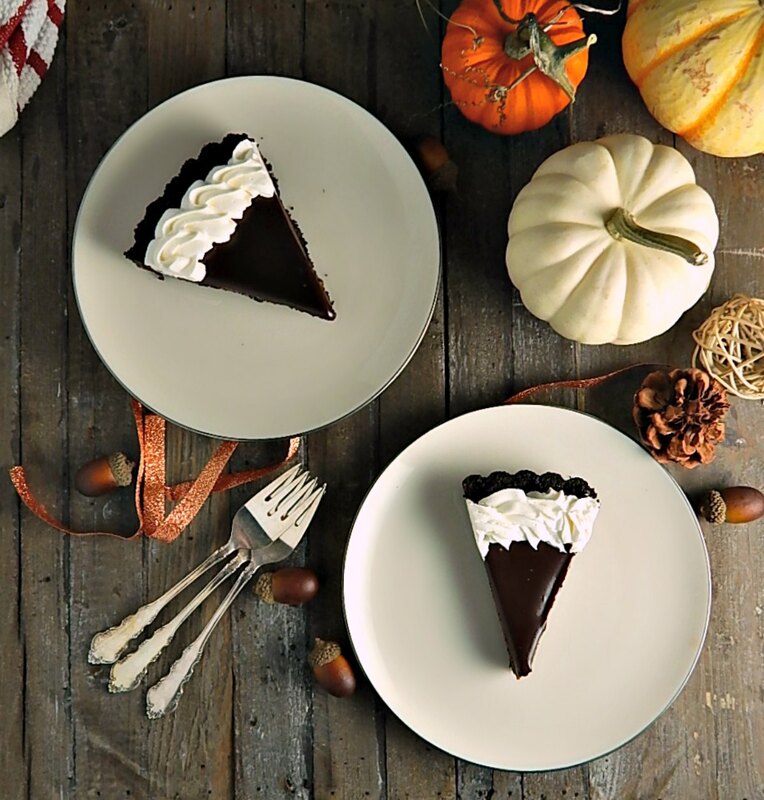 From the bottom of the perfect cookie crumb crust, the lush deep dark chocolate pudding-like layer all the way up to the gorgeous glaze – it has such a smooth finish it’s almost mirror like. You can see in the photos that the glaze actually reflects the bit of whipped cream I’ve piped around the edge. It’s so rich you do need that whipped cream or maybe just a big glass of milk. If you’re not a fan of deep, deep chocolate flavor, sub in some lighter milk chocolate for some of the semi-sweet in the filling but don’t touch that glaze, it’s perfection! Chocolate Glazed Tart – just look at that whipped cream reflected in the glaze. So let’s talk about the crust for my Chocolate Glazed Tart. The original recipe called for a problematic chocolate graham cracker crust, but chocolate grahams can be hard to find and different brands of graham crackers seem to react a bit differently in the crust. Plus graham crackers seem to be always changing in size over time and with different brands. I use my Oreo crust (which snobby me found was even better than my chocolate wafer crust.) So go Oreo coz they’re easy to find! If you want to read more about making an Oreo crust, see Mastering Oreo Crust like a Boss. If you use a different cookie, press the crumbs together in your palm after it’s mixed. If it holds together you’re golden. If it doesn’t you might need to add a bit more butter, about 1/2 tablespoon (1 1/2 teaspoons) at a time. This tart really only takes minutes to make; the majority of the time is spent waiting for it to cool, first the crust, then the filling, then the glaze. For the filling, I just heat up my cream in pyrex measuring cup in the microwave. It takes me a minute and a half, but microwaves vary, so keep an eye on it. Then it’s just a matter of pouring the hot cream over the chocolate and stirring everything together. Watch the Chocolate Glazed Tart carefully in the oven towards the end of the cooking time. It will seem very liquidy in the last few minutes and then in a blink, it’s done. So it goes from pretty raw to done quickly. For best results, make sure it’s still jiggly in the middle. Why do I want to sing “get jiggly with it?” I’m so weird sometimes. I use chocolate chips a lot when I make this tart, but the better chocolate you use, the better the tart will be. For me, even semi-sweet is a bit dark, and I’m a chocoholic. I think maybe because the tart itself has no sugar the chocolate flavor is intensified. If you aren’t cray cray about dark bitter chocolate, go half milk chocolate and half semi-sweet and see what you think. When the tart comes out of the oven, it might be puffy – and you might wonder how you’ll glaze it. Don’t worry, it comes down to a nice, even layer as it cools. When you glaze, do make sure the cream is good and hot so the glaze stays liquidy, make sure your tart is at room temp, and know you’ll only get one shot at it. It’s easy to glaze, though – just drizzle your chocolate mixture and turn and tilt the tart. Don’t touch it or try to smooth it or the glaze will be marred. And while the tart, I think, needs that whipped cream, the whipped cream can also cover any imperfections in the glaze around the edge of the crust. I actually double the glaze from the original recipe…it’s just gorge! There’s one more thing about this tart – when you cut it, go straight down, then pull your knife straight back towards you, horizontally, so to speak. Wipe the blade and make the next cut and your slices should come out beautifully without the layers smearing together. To lift the slices out, feel with the tip of your knife for the edge of your tart pan; it will be about 1/4″ in, and make sure to slip the knife between the crust and the tart pan bottom. Be careful so the crust doesn’t crumble. So would you serve this tart at Thanksgiving, as long as you had at least one pumpkin dessert? I would, at Thanksgiving, Christmas, New Year’s or any dinner party! If you’d like to see a few of my other pics for Our Favorite Thanksgiving Desserts, watch my little video, below. I already mentioned I often use chocolate chips for the chocolate and Oreos for the crust, and I don’t really do it so much for cost savings, although both probably are a savings over some of the other options. The chips I use because I usually have them and the Oreos because they really do make a fantastic crust. If you’re looking for better chocolate, Aldi has a couple great bars; they’re oversized candy bars but I often use them for baking and of course, you’ll find great chocolate and other gourmet items at Trader Joe’s. There is a little corn syrup in this tart, in the glaze. It makes the tart glaze gorgeously shiny with just the right fudgy texture. People freak about corn syrup but do keep in mind that there is a difference between corn syrup and the commercial high fructose corn syrup. Wipe the lip carefully before you seal it up and it will keep, literally for years in the cupboard, even after it’s open. Mix together the crumbs and butter. Place tart pan on a cookie or baking sheet. Press crumbs evenly onto bottom and sides of the tart pan, making sure crumbs are level with top and the sides are a hair more than 1/4″ thick. Bake until firm, about 10 minutes. Remove and set aside to cool, about 15 to 20 minutes. Don’t remove the tart pan from the baking tray. Bring cream to a boil in a pan or in the microwave. Add chocolate to a bowl, then pour cream over chocolate and let stand 5 minutes. Gently stir until smooth. In another bowl, whisk together eggs, vanilla, and salt. Stir into melted chocolate. Pour filling into cooled crust, which should be still on the baking tray at this point. Gently pop any bubbles, but don’t tap the pan against the counter or do any other violent act to it. Bake until filling is set about 3 inches from edge but center is still wobbly, 20 to 25 minutes. (Center will continue to set as tart cools.) Cool completely in pan on tray for about 1 hour. Bring cream to a boil and remove from heat. Stir in chocolate until smooth. Stir in corn syrup, then warm water. Pour glaze onto tart, then tilt and rotate tart so glaze coats top evenly. Let stand until glaze is set, about 1 hour. Only after glaze is firm and you are close to being ready to serve, pipe rosettes or other pattern around the outer edge. Add cream to small, narrow bowl, beat until soft peaks are beginning to form. Add cornstarch and sugar and beat until very stiff. Transfer to a piping bag or a Ziploc with the corner cut off and pipe in desired design around the edge of the tart. Tart is best the day it is made but can be made, without glaze, 1 day ahead and chilled. Bring to room temperature before glazing. If desired, use a bittersweet chocolate. For best results, keep the tart in the tart pan on the baking tray until ready to transfer to the final serving dish or cake stand. The tart is sturdy but keeping the tart, pan and all on the tray will prevent any accidental unmolding. I’ll be sharing my Chocolate Glazed Tart at Fiesta Friday #250, cohosted this week by Jenny @ Apply To Face Blog., Jess @ Cooking Is My Sport, Jhuls @ The Not So Creative Cook and Judi @ cookingwithauntjuju.com. Thanks, guys for hosting for us for so many Fiesta Fridays! #250 is a landmark for sure! This entry was posted in Click here for Fabulous Food Posts and tagged Chocolate, Chocolate Chips, corn syrup, Cream, Desserts, Oreos, Pie, Pie Crust, Tart, whipped cream. Bookmark the permalink. Beautiful and yummy, I want to grab a bite!! Hi thank you! I wish I could share! Hi Kat,thanks! Very pretty and so delish!! It really does look stunning, I am a massive fan of dark chocolate. Looking forward to sharing the co-hosting FF duties with you this week! As usual, I’m a bit behind but it looks like everyone was delayed a bit – probably from Black Friday!! I always love seeing your picks for Fiesta Friday. Yum Mollie what a treat – I would struggle to restrain myself with this in front of me! Laura, I ended up giving most of it away!! I just couldn’t have what was left around!! OMG Oreo girlfriend! I so agree. I don’t think there is a better bottom!!!!! This looks just divine/stunning. I am in chocolate love. Off to pin this bad boy. Thanks for sharing it with #FiestaFriday ofcourse! Hi Jenni, thanks much, and thanks for hosting for us!! 🙂 Sorry to reply so late! You just keep tempting my sweet tooth. A lovely and decedent dessert indeed. the Oreo crust drew me right in. One great looking dessert. I seem to be behind in my comments! Again!! lol! Thanks, Ron. It’s a chocolate lover’s dream! I used this recipe for our dinner last night and the results were delicious! Thanks for your sharing. Easy and fun! And tastes like chocolate truffles! Thanks for commenting, Anthony! Thanks – Friday Fiesta rocks. Have a very Happy Thanksgiving. Oh yes, and families HAVE to have what the have to have! I’m that way, too. At least about the pumpkin. You should have seen the Thanksgiving that my Grandma announced she wouldn’t be making pies anymore. My uncle and dad argued about which family was taking the extra pie, all in fun, but it was a big deal…then the pie was gone. Each party accused the other, my uncle searched our car and then as we backed out to the end of the driveway as they were all waving goodby on the porch, my dad stopped, picked up the pie he had hidden in the snow drift and ran back to the car with it and took off, my uncle chased the car. Funniest thing ever! Hi, thanks much!! That chocolate was soooo smooth!! Mollie, you really surprise us all the time!! You know this party will gonna special, huh? So you have this divine, enticing tart!! It looks so beautiful and I am sure it is heaven in every bite!! Thank you for always sharing delicious dishes to us! Happy 250th Fiesta Friday!! Wohoooo!! !